jOpenDocument is Open Source (under GPL or commercial license). - Class Length to efficiently and accurately handle computations and conversion between different units. - Google Drive compatibility : sheets now always have display=true ; use centimetres by default for lengths. - LibreOffice compatibility : by default no longer include years, months or days for durations. See MutableCell.getTimeValueMode(). - Framework base classes (XMLVersion, ODValueType, Style, etc) are now thread safe. This allows 2 threads to use 2 documents concurrently, but one document still cannot be used by 2 threads. - ODPackage.validateSubDocuments() now also validates the manifest. - No longer write time zone part, allow to configure the framework to behave like LO<4.1 or LO>=4.1 with regards to parsing dates with time zone (see ODValueType.isTimeZoneIgnored()). See also FixTimeZone for existing documents. - Column.setWidth() now updates the width of its table. - Handle Range with only one cell. - A lot of style classes now return Length instead of Float or BigDecimal. Here is the stable version of jOpenDocument 1.3. The next step is the creation of a 1.4 branch. 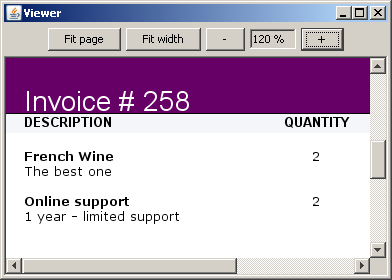 jOpenDocument 1.3 is a major version of jOpenDocument. If you are using a previous version, we strongly encourage you to update. jOpenDocument 1.3 rc2 is now available for download. jOpenDocument 1.3 rc1 is now available for download. - OOConnexion handles UNC paths. - OOInstallation handles LibreOffice 3.5 and 3.6. - Various getTextValue() methods (using TextNode.getCharacterContent()) now correctly ignore graphical elements anchored to the paragraph. - Cells with conditional styles having values that cannot be evaluated by conditions (e.g. a cell with >=5 condition and 'foo' value). - Searching for the value of a formatting property (see §16.2 of OpenDocument v1.2, we now look in ancestor styles and in enclosing elements). - ODSingleXMLDocument.saveAs() now saves to a flat XML, use saveToPackageAs() to continue to save to a package. - All XML entries in ODPackage are now parsed to Document (e.g. Basic/script-lc.xml). Previously only sub-documents (content.xml, styles.xml...) were parsed, all other entries were byte. jOpenDocument 1.3 beta 1 is now available for download. It contains a lot of improvements and requested features. Because we are focusing on our open source ERP named OpenConcerto, we had to postpone the release of the 1.3 branch. Our ERP is powered by the jOpenDocument 1.3 branch for document generation, PDF conversion and display. OpenConcerto being downloaded 300 times per day, we are pleased to announce that our library is now the most used one! Here is the final version of jOpenDocument 1.2 . The next step is the creation of a 1.3 branch, the 1.3 branch will be dedicated to new features like the long awaited ODT Viewer. jOpenDocument 1.2 contains small bug fixes (better handle elements without a style and fix the creation of empty tables). We are pleased to release the 1.1 version of our OpenOffice addon, it contains all the bug fixes regarding the known issues. The first version of the addon was downloaded 10802 times, let's hope that our servier will not be on fire! As usual, the update is highly recommended. jOpenDocument 1.2 beta 3 is available for download. jOpenDocument 1.2 beta 2 is available for download. We are pleased to announce the first beta version of the next version of our open document library. A few years back, we started the development of what is called now jOpenDocument. Today, I'm glad to announce that we reached 10 000 downloads of jOpenDocument 1.1 ! We recently switched our mailing list to googlegroups and now provide a mailing list archive. We had a lot of requests regarding an "ODT Viewer" in order to provide a way to display, print and export to PDF your text documents. jOpenDocument already provides an "ODS Viewer" for Spreadsheet documents. Unfortunatly we have no budget to pay a full team working on an ODT renderer, so you will have to be patient (or to find us sponsors). Seeing the growing number of request about commercial license and support, we added a special topic on the website. It will not mean that we will stop providing help and free support on the mailing list. (we are considering a mailing list archive too). We are glad to announce that Sun Microsystems awarded us with a Community Innovation Bronze Award for "Java + Open Document = jOpenDocument", more here. We are pleased to announce the third beta version of the next version of our open document library. We are pleased to announce the second beta version of jOpenDocument 1.1.
jOpenDocument 1.1 beta 2 is available for download, a Java 5 version is included. In order to avoid fragmentation, the next version of the jOpenDocument model will be based on the in-progress ODFDOM from Sun Microsystems. We plan to join forces and wish to share a common model. Our top level API will not change, so you can start using now jOpenDocument 1.1 without fear. We are back from the US, JavaOne was great and we are pleased to announce the the first beta version of jOpenDocument 1.1.
jOpenDocument 1.1 beta 1 is available. It includes bugfixes and requested enhancements. The first release of the OpenOffice Addon is available. jOpenOffice.org is now 300 visitors (downloads) per day, amazing! The first release of jOpenDocument is available. A new tutorial about PDF generation is online. We are working on the first release that is planned on April 19th. Tutorial and a full documentation will appear soon after. Meet us at JavaOne 2008 ! jOpenDocument 1.4rc2 available for download. jOpenDocument 1.4rc1 available for download. jOpenDocument 1.3 available for download. jOpenDocument 1.3 beta 1 available. jOpenDocument 1.2 final available for download. OpenOffice Addon 1.1 available for download. jOpenDocument 1.2 beta 3 available. jOpenDocument 1.2 beta 2 available. jOpenDocument 1.2 beta 1 available. Bronze award from Sun Microsystems, more here. jOpenDocument 1.1 final available for download. jOpenDocument 1.1 beta 3 available for download. jOpenDocument 1.1 beta 2 available for download. jOpenDocument 2.0 will join forces with ODFDOM from Sun Microsystems. jOpenDocument 1.1 beta 1 available for download. OpenOffice Addon 1.0 available for download. jOpenDocument 1.0 available for download. A new tutorial about PDF is ready.